Time seems to be flying by out here in Ontario, a little too quickly for my liking to be honest. My time here at the AFA seems to keep on offering me a range of new and exciting experiences. Over the past month I’ve had the opportunity to see some timber harvesting operations, establish some silvicultural research and further my understanding of partial cutting systems by undertaking more tree marking. I was really pleased to have been able to visit some of the harvesting operations in the park over the past few weeks. Having had experience back home of working in steep ground harvesting, it was fascinating to gain an insight into the entirely different methods that are used out here in the Park. I’ve been far more accustomed to the cut to length method that involves only a harvester and forwarder cutting and processing the tree at the stump. 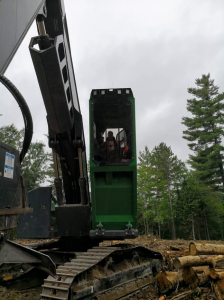 However, the vast majority of logging in the park uses the tree length method which omits the need for cutting a tree into specific products in the forest, instead it is hauled in its entirety to the sawmill where it can be processed. A very different range of machinery is required for harvesting in the Park as opposed to what is used in the UK. Feller-bunchers are the norm and are something I had never seen until recently. I was astonished at the level of productivity they are capable of whilst being sufficiently maneuverable to carry out logging in partial cutting systems and not damaging any residual standing trees. An important aspect in preventing any damage to residual trees is the careful demarcation of skid trails. This is done by the AFA’s harvesting supervisors and provides the feller-buncher and grapple skidders that follow behind with a route through the forest that ensures all the necessary ground is covered, whilst causing the least possible amount of disturbance. Once all the marked trees have been felled and bunched into piles in a particular area the grapple skidders follow the trail and pick up each bunch of trees. Working from the back of the cutblock these powerful machines haul each bunch of trees out to a landing beside a road. From here they can be loaded on to timber lorries. Unlike the UK where maximum loads are limited to 20 tonnes, these lorries can haul up to 40 tonnes of entire trees. Whereas in the UK the lorries are capable of loading the timber themselves this is not possible out here. A loader is located at the landing and is responsible for lifting timber from the landing onto the lorries. Given the size and weight of the trees here it is unsurprising that these machines can be rather ginormous and are capable of moving and manipulating trees up to 10 tonnes with consummate ease. ‘Not a bad view from up here’ having a sit down in a loader on one of the harvesting sites. Like many other things I’ve noticed out here it is the scale that is so entirely different to anything back home. 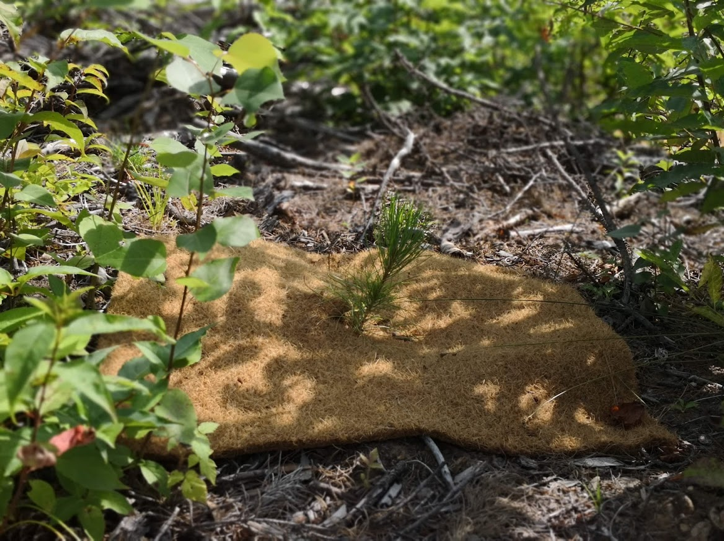 It’s not uncommon for an area within the Park that is made available for harvesting to be more than 500 hectares. Often there is little or no roads already in place and therefore a huge amount of planning must go into establishing the necessary infrastructure to even make any harvesting possible. This is something I’m hoping to gain a better appreciation and understanding of over the remainder of my time here. Although I haven’t had a great deal of exposure to the destination of the timber outside of the Park, its importance to the local economy and almost every town around the Park’s boundary is clear. There are 9 mills which receive most of their timber supply from within the Park and these mills are often the major employer within these small towns. I’ve also had the opportunity to establish some rather novel research into competition management. The AFA are unlike other Sustainable Forest Licences’ in that they do not carry out any chemical spraying in order to control vegetation and less desirable tree species. Instead, the rapid growth of species such as Poplar and Red maple is curtailed by brushsawing. This is usually a costly and a less effective means of vegetation management compared with spraying herbicide. For this reason the AFA have been interested in looking into the practicalities of using mulch matts placed around newly planted trees as a means of preventing other species from out competing the desirable growing stock. A red pine seedling poking through a coconut mulch mat. I’ve been trialling a couple of different types of mulch mats. One is a coconut fibre based material and the other is a simple black plastic type. It will be interesting to see how both these turn out in the future. Unfortunately I won’t be here to see the results but hopefully the experiment should provide some interesting information into whether or not this method might be applicable in the future.